Last week, USCGC Bertholf was on patrol in the East China Sea, enforcing sanctions on North Korea. Normally based in Alameda, California, the National Security Cutter’s lengthy assignment to Indo-Pacific command may mark a shift in American tactics. China has long used both its fishing fleets and its coast guard vessels to press its claims in the East and South China seas. Earlier this month, for example, Chinese fishing boats chased Filipino fishermen away from some sandbars in the Spratley Islands. The feature is known as Thitu Island and is administered by the Philippines. According to the Nikkei Asian Review, Filipino Defense officials worry that this is the latest example of what they called ‘cabbage’ strategy – saturating disputed areas with ostensibly non-military assets. Greg Poling, director of the Asia Maritime Transparency Initiative told Nikkei that there are hundreds of Chinese fishing vessels in the Spratleys on any given day. The use of fishing boats also effectively undermines any challenge by the Navy, which would be seen as disproportional. 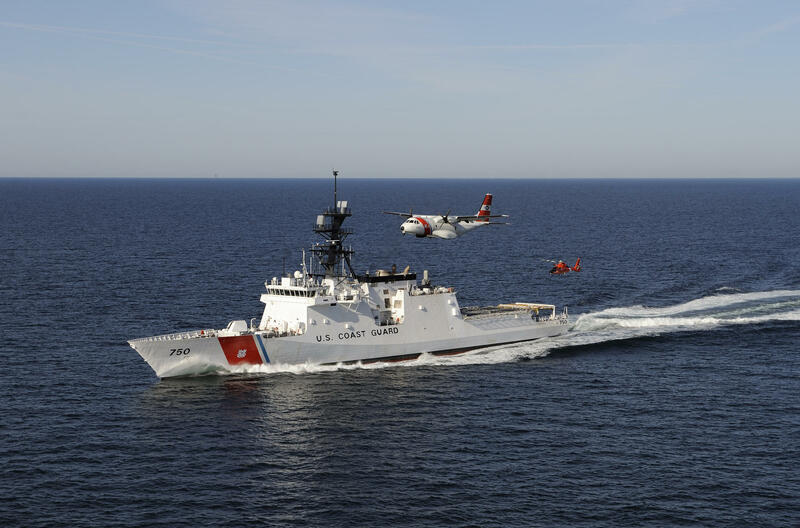 Coast Guard vessels, on the other hand, offer an entirely different level of response. Just how often, and how long, U.S. Coast Guard Cutters will be dispatched to these distant waters remains to be seen.